Chinese architect Li Xiaodong surrounds the building for offices and homes of brick crossed Bmcherbah Archi-new - Free Dwg file Blocks Cad autocad architecture. Archi-new 3D Dwg - Free Dwg file Blocks Cad autocad architecture. Chinese architecture completed Moriyama Prize-winning editorial Moriyama Prize me Xxiaodong Li Xiaodong his work on the offices and dormitories building in the Chinese province of Zhejiang Zhejiang. As the architecture also winning the Royal Architectural Institute of Canada award for its design "modest" for the library project for the yuan, to design interfaces that the current building in the form of screen "bay" of brick crossed in the rural site outside the borders of the Chinese city of Ningbo. This building will be part of a larger development project; therefore designed architecture offices and Accommodation team that will build the rest of the complex. Adopted the concept design on the idea that to be the origin of the least possible impact on the surrounding landscape. "In order to respect and appreciate the authenticity of the site in the valley as a whole Dechen we obviously we proposed a series of architectural interventions in order to create a way of distinguishing the net landscape experiences." According to the architects told me in the team. The building is located on the most flat section of the mountain slope of the site, as most of the building on one floor distributed while the smaller part distributor design on the second floor towards the north of the site where the ground is attributed declines by about 3 meters. 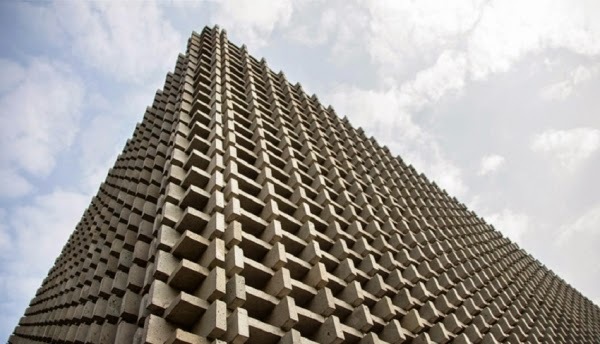 Featuring mini Busbandath which is a perforated wall appears at first glance as if made of cement; but the fact that it combines technology with traditional craft of modern engineering component of a complex network tiled. Explains Architects "We took so familiar concept such as wall tiles solid, and created instead tiled screen open and influence and floating around its perimeter. This in turn creates a contemporary response in line with the local Chinese concept of vacuum where mass and context are not objects solid but becomes a series of porous environments related." This is an external wall skin wraps around most of the perimeter of the building, and behind the interior spaces are distributed around two courtyards located internal to represent a sense of community among the residents. "Soften the relationship between the building block of organic and the environment through the interface that looks like a screen wrapped around the building so as to make the block disappear and become variable layer interact between inside and outside." As for those two courtyards containing four trees have been determination social Kfragat located between workspaces, dining rooms and common living. Opens second yard on transcendental mountains, was conceived Architects this vacuum residential area more privacy can be accessed from the dormitories in the southern projected. The EXA internal interfaces of the courtyards bamboo panel is designed to give warmer Atdhad with gray harsh exterior brick.